It feels good to roll your sleeves up and give back. That’s what volunteers from Navy Federal Credit Union (NFCU) learned when they helped restore a local nonprofit’s food pantry and thrift store. The group donated funds, time and talent to rehabilitate the Lorton Community Action Center (LCAC). “Melissa, who runs the thrift store, was playing holiday music the day of our project because it felt like such a gift to LCAC to have all these people doing so much work at their center,” said Julie Hill, who led the team of NFCU volunteers and is Chair of the RT-AFF Board of Directors. LCAC provides food, clothing and other essential support to community members in need. Sometimes, they focus so much on helping others that they forget to help themselves. That’s why the center needed repairs. Rebuilding Together and NFCU stepped in to help. The center’s Executive Director Linda Patterson appreciated the support. “As a nonprofit, you don’t always have the money to take care of your physical facilities because you want to put your resources towards serving families in need,” she said. “We couldn’t have made these improvements without RT-AFF and NFCU,” Linda said. Volunteers renovated LCAC’s food pantry. They repainted the doors, creating a more welcoming entrance for families. NFCU teams also repaired rotted steps, power-washed the building, and built a fence around the dumpsters. Linda said the added fence gave her, “a lot of peace of mind because the dumpsters felt like a safety hazard.” “I was worried that clients and their families could get too close to them when the trash truck was emptying them,” she said. The center’s thrift store was spruced up with fresh paint and new flooring. Volunteers also built a step with a railing to prevent visitors from tripping. NFCU noticed this safety issue when they first started the volunteer project. NFCU volunteer teams included employees, families and friends. Six pairs of parents and their children volunteered together on the project, something NFCU always encourages. “We want children to understand the importance of giving back in their communities,” Julie said. The credit union supports RT-AFF with generous financial support every year. In addition to employees giving their time, NFCU also held a food drive to stock the LCAC food pantry. That way, every employee had a chance to give back, not just people available to work on the site. They collected cereal, canned tuna, canned vegetables and other goods. 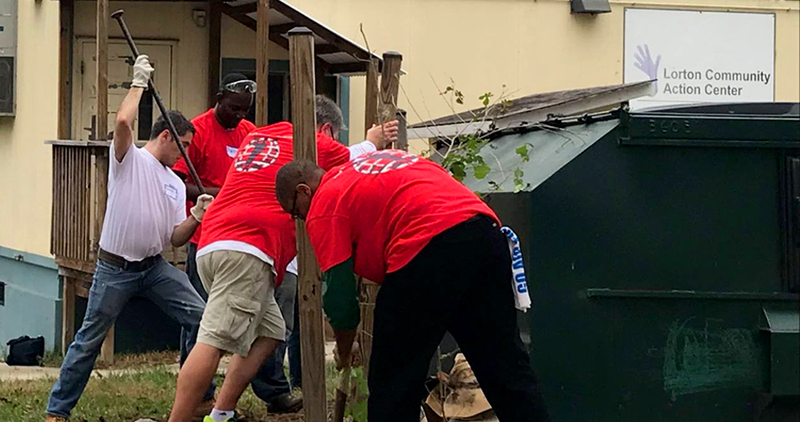 At Rebuilding Together, we’ve partnered with NFCU for over 19 years, during which time more than 2,500 NFCU staff and family members have volunteered for rebuilding projects. We rely on the generous financial support of our partners and their dedicated volunteers to support our organization and complete projects for low-income homeowners and nonprofits like LCAC. LCAC’s pantry serves over 200 low-income families every week, and 7 percent are members of the military. The thrift store provides clothing, household items and furniture to the families. Other community members shop at the thrift store looking for bargains and treasures. Making the thrift store more appealing to paying customers will bring more revenue to support the nonprofit’s community services. Support from RT-AFF and NFCU means the world to the local nonprofit. “The volunteers were gracious and genuinely happy to do a lot of incredibly dirty and difficult jobs,” Linda said. Are you interested in getting involved and giving back? Learn more about how your company can partner with RT-AFF to help our neighbors in need.